Here’s anoth­er pho­to­graph I made last week, along Oliv­er Lake out at the Min­is­tik Lake Game­bird Sanc­tu­ary. 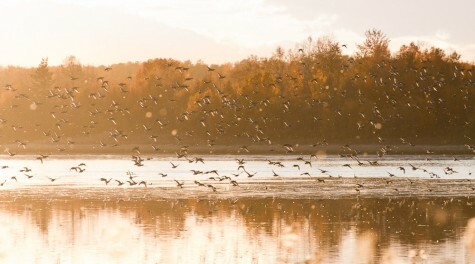 As the sun was set­ting, hun­dreds (if not thou­sands) of ducks were set­tling on the lake, ris­ing in large flocks if unnamed pho­tog­ra­phers (or their dog) moved too quick­ly. I nor­mal­ly try hard when pro­cess­ing a pho­to­graph to make sure that there is detail in both the high­lights and shad­ow. In this case how­ev­er, I found that push­ing the bright­ness up real­ly did a bet­ter job of cap­tur­ing the mood of look­ing west across the lake into the sun, watch­ing the birds against the bril­liant, back­lit fall colours. They say the rules are there to be bro­ken, right?